Perrie Edwards appears to have confirmed bandmate Jesy Nelson's split from fiancé Jake Roche. The Little Mix star took to Snapchat on Friday, taking a video of three toys and joking that they represented her, Jesy and Leigh-Anne Pinnock. 'When single life got you like... the three amigos always and forever- plus Jade and Jade', she captioned the shot, also referring to only non-single bandmate Jade Thirlwall and her boyfriend, The Struts rocker Jed Elliott. She then added a video as they played with the dolls, tellingly singing 'Single women!' loudly in the car. Mailonline has contacted Little Mix's spokesperson for comment. The Snapchat comes after Jesy's relationship has been plagued with break-up rumours. 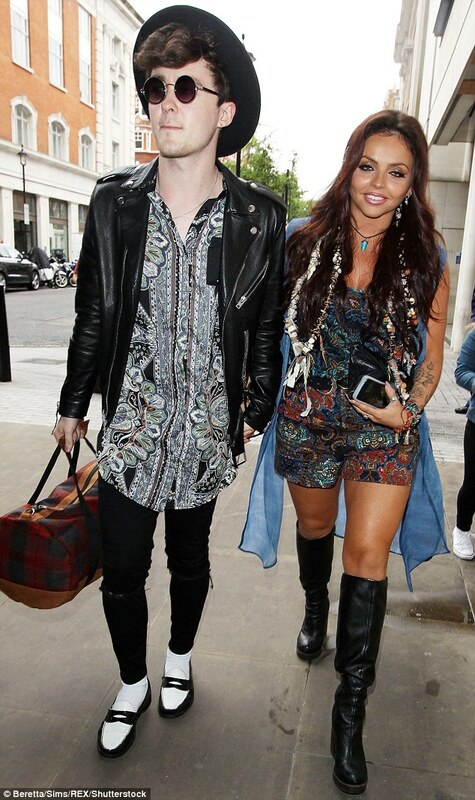 Jesy's romance with fiancé of 18-months Jake was once again thrown under scrutiny this week as sources toldThe Sun that the duo have been broken up for weeks - despite Jesy wearing her ring during a TV appearance on Sunday. The 25-year-old Little Mix songstress first sparked split reports when she was spotted without her engagement ring, yet the return of her rock last week appeared to point to harmony. The couple were first surrounded by rumours of a split after it emerged they had unfollowed each other on Instagram and Jesy stopped wearing her engagement ring to public appearances. Jake and Jesy have been engaged for a year and a half after the singer employed the help of Ed Sheeran to propose to Jesy in July 2015, while on stage at the Manchester Evening News Arena. Contrary to reports of parting ways, in an interview two months ago Jesy admitted that they were in 'no rush' to tie the knot and insisted they are deeply in love. The insiders' suggestion about Jesy's ring is contradictory following her appearance on Sunday. After causing concern among fans with the absence of the jewellery, the Essex-born beauty appeared on Channel 4's Sunday Brunch wearing the sparkler - in the first sighting of the ring in recent weeks. And while Jesy confessed that merely being boyfriend and girlfriend 'undermined' their relationship, she also disclosed no haste in saying 'I do'. The pop princess added: 'We're in no rush. We want to travel the world together. There's so much we want to do together, and at the moment, we're focused on our own careers that there just isn't time. 'I think when we know, we'll know, and we'll do it, and [it will] probably be really intimate, hardly any people there. We're very much in love, and we'll do it when we feel the time is right,' she gushed. Despite looking to the future, the past weeks have been quite rocky for the twosome, especially on the social media front. Rixton rocker Jake continued to cause concern among fans as he shared a series of images of black clouds on Instagram and Twitter with no captions. Meanwhile Perrie is rumoured to be starting a romance with Arsenal footballer Alex Oxlade-Chamberlain. A source told The Mirror: 'It's definitely official, the pair are the talk of the locker room since Perrie came to a game back in early November. Alex wanted to keep on the down-low as he isn't one for showbiz parties or being in the public eye. It's very early days but Alex is very keen on Perrie - and he is known as the nice guy of the team - very different from her usual types'.